After Lum ran dozens of experiments and used state-of-the-art mass spectrometry and NMR (nuclear magnetic resonance) spectroscopy at JCAP to analyze the results, they found that three of the products – ethylene, ethanol, and propanol – had different isotopic signatures showing that they came from different sites on the catalyst. “This discovery motivates future work to isolate and identify these different sites,” Lum said. 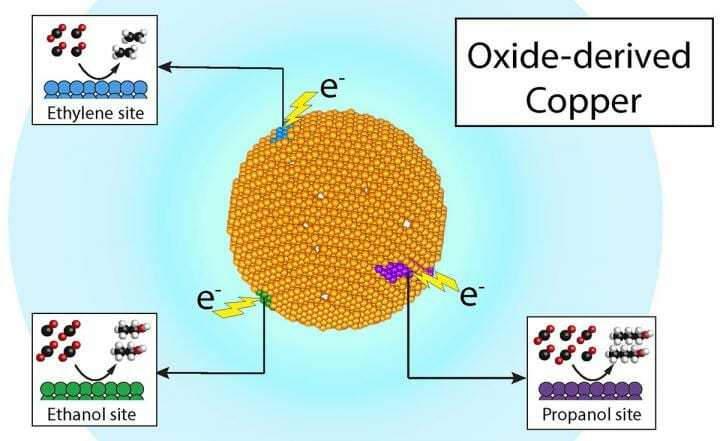 “Putting these product-specific sites into a single catalyst could one day result in a very efficient and selective generation of chemical products,” Lum said.